Email Templates Collection is a lightweight software built to display 300 professional email newsletter templates, making it extremely easy to pick the right one for you. All our email templates have been designed by professional graphic and marketing experts: so what you will get is a showcase containing a vast number of attractive ready-to-use layouts. Email templates are sorted by category, in order to help you understand which one fits the needs of your business — be it fashion, hosting, sport, real estate or anything else: there are fifty categories available so to make the choice much easier. Also, each newsletter template can be previewed in full-size with a mouse click, to check better all its features. Once you have chosen the right one for your needs, you can export it as .hmtl or .eml format and upload it into your favorite mailing software: here you will be able to easy edit it as you like. 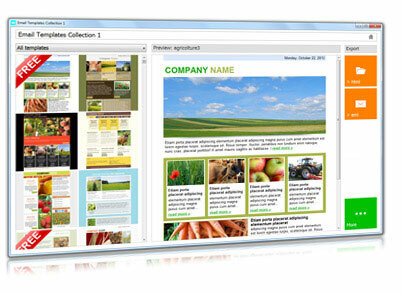 Moreover, any template has been tested against and resulted fully compatible with all major email clients and webmail. Which means that your newsletter will be displayed in the same way, and look perfect, no matter which application or web service your customers use to open it.